WARSAW — A fresh probe into the deadly 2010 crash of a Polish presidential jet in Russia suggests an explosion likely caused the aircraft to break up in the air, investigators said Monday. The commission of inquiry "considers the possibility of an explosion to be quite likely", said the narrator of a video prepared by the investigative body, and shown to reporters. "In light of the experiments conducted (by the commission), we can say that the most likely cause of the explosion was a thermobaric load that set off a strong shockwave." 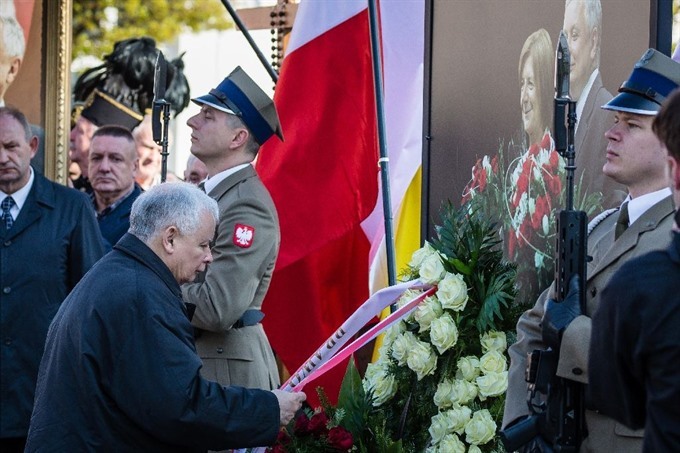 The claim came on the seventh anniversary of the crash on April 10, 2010 in Smolensk, western Russia, that claimed the life of president Lech Kaczynski and 95 others, mostly senior Polish statesmen. Poland’s governing rightwing Law and Justice (PiS) party, led by Kaczynski’s twin brother Jaroslaw, has long insisted the crash was no accident. "We’re getting closer and closer to the truth," Jaroslaw Kaczynski said Monday, adding he believes that is why "we have been the target of hate". Speaking to supporters in front of the presidential palace in Warsaw, he accused Russian air controllers of having "without a doubt deliberately" misdirected the aircraft at landing. He added that "there is a high degree of likelihood that an explosion occurred" but said the theory was not "definitively proven". Defence Minister Antoni Macierewicz, who says the crash was the result of a Polish-Russian conspiracy, last month accused former Polish premier and current EU President Donald Tusk of "diplomatic treason" over an earlier probe into the crash. After winning power in 2015, the PiS launched a new investigation into the disaster, which Polish and Russian investigators earlier attributed to human error and bad weather. The previous inquiry found the crash was in part triggered when the jet’s wing clipped a tree near the runway. Waclaw Berczynski, who heads the new team of Polish investigators, gave a different account. "The plane started to break up and lose parts in the air; they fell to the ground far from where the infamous birch tree was... The tree had no impact on the crash," he told public broadcaster TVP Info. Berczynski said investigators based their new conclusion on an analysis of a conversation between the plane’s pilots and Russian air traffic controllers on the ground. Maciej Lasek, who participated in the first inquiry, rejected the conclusions Monday, telling news channel Polsat News that the new commission’s members "had never investigated a plane crash before and don’t have the expertise to do so". Polish prosecutors said earlier this month that fragments of the plane were being sent to four labs abroad to check for traces of explosives. Prosecutors had said last week that based on a fresh analysis of the evidence, they would charge the controllers with having "deliberately causing a catastrophe", a theory the Kremlin immediately denied. Prosecutors had already pressed charges against the two Russian air controllers in 2015: one for "being directly responsible for having endangered air traffic" and the other for "unintentionally causing an air traffic disaster". Polish justice officials have also been exhuming the remains of the victims to establish the cause of death. Warsaw has repeatedly asked Moscow to return the wreckage of the plane, but Russia says it will only do so once its own inquiry is over.